F&W's Kate Krader spotlights the best places to go for every type of spring break. It’s spring break season, which of course means you can find yourself in the kind of bar that Bill Hader’s Stefon raved about on SNL: “This place has everything: Lights, psychos, Furbies, screaming babies in Mozart wigs, sunburned drifters with soap-sud beards.” Or you can ignore spring break in a great historical spot in NOLA and pretend it’s not spring break right outside on Bourbon Street. Monty’s has a raw bar stocked with oysters, clams and five kinds of ceviche (including lobster, conch and tuna), a nice weekday happy hour (half-off liquor and 30 percent off wine and beer), assorted DJs on the weekends and a big fat pool. The signature cocktail is the Pain Remover #1, #2 or #3, depending on how much rum you want in the creamy coconut-and-pineapple drink. The party here lasts only so late though: Monty’s closes at midnight on Saturdays. Brooklyn is not the spring break capital of the world. But if you’re determined to feel like you’re at a beach in the middle of Williamsburg, Surf Bar has a sand floor, surfboards on the ceiling and plenty of Hawaiian leis. They make a mean lobster roll and assorted fish chowders, and plenty of their drinks require paper umbrellas, like mai tais and frozen margaritas. Right on touristy Bourbon Street, where almost every day is like spring break’s aftermath, is the Old Absinthe House. The original bar was founded in 1874; famous patrons have included Mark Twain, P.T. Barnum and Franklin D. Roosevelt. In addition to seven kinds of absinthe, there’s the signature Absinthe House Frappe (absinthe, anisette and a splash of club soda over crushed ice) and other classic Southern cocktails such as the Sazerac and, of course, the Hurricane. This 9,000-square-foot bar and club has everything: multiple bars, dancing cages, 88-ounce guitar cups, the Beer Pong World Championships. The cocktail menu has a section of Chick Drinks, including the coconut rum–spiked Rock Me Like a Hurricane, and Manly Drinks, including the whiskey–and–Red Bull concoction Burning Ring of Fire. 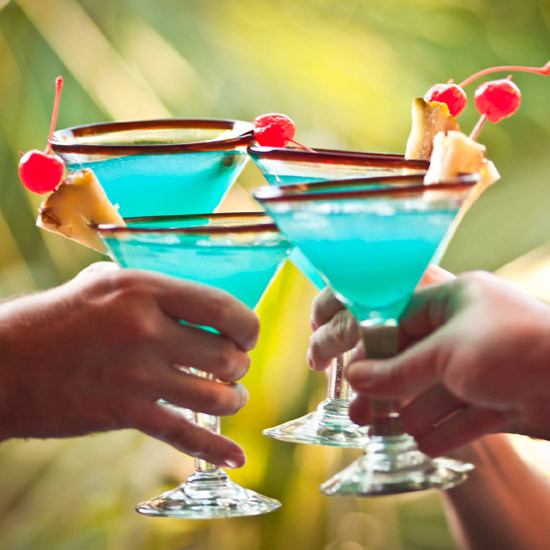 Related: Best Tiki Bars in the U.S.